At the beginning of the week, I was concerned as to how my students saw themselves in the stories we read. Seeing ourselves in the character is essential for comprehension and finding joy in reading. Literature can be a great life coach. The fact that students might not see the actions of characters reflect their lives or attitudes was a big concern. Did they see it but weren’t able to articulate it, were the characters too dissimilar to them, or were they not developmentally ready to access this type of thinking. Picture books are a wonderful way to approach big ideas in literature. The selection is vast and deep concepts are accessible. I chose books with characters who had no physical resemblance to children, ants and Sneetches. I wanted students to attach to the emotions and points of view of the characters, not the way they appeared. Today, our characters were peacocks and swans in Mem Fox’s beautiful and frightening Feathers and Fools. I started out by asking which character they would be in the story. Once we got past the introduction, I asked them to keep their thoughts in their head and jot about what they would do, think or feel like as a character in the story. When the peacocks and swans had made their foolish choices I added on asking them to jot about what they had learned. At recess, I snapped pictures of their journals. I would be a peacock because I’m curious and I observe. But then I’m a swan because I would be terrified when they started to attack. At some points in my life I would be foolish because I would be mean to people say stuff about them. Later on I would realize how stupid I was to do that. I should never do that again. OMG. They all just died. We are foolish and that can be bad and lead to conflict. This connects to me when I always do something stupid. For example, when I play ball in the house. I am the swan because I am foolish too. Like them. I bet we are all foolish and I would do the same thing like the swan, but in the human way and I would think bad things in the human way and I would feel mad and scared. When you read that story that made me better because we are the same and we shouldn’t be scared. They see themselves, their foolishness, their mistakes and their humanity in this text. I credit Mem Fox, Terje’s insightful questions, and the fact that students were allowed to write their thoughts. Most students were able to connect to some degree. One who struggles in literature was the most troubled by this exercise saying, “I just don’t see it.” Perhaps the lack of connection is why. Today, our read aloud will feature children. These children will look like them and act like them. They will be asked to choose a character they see themselves in, and then live in the story considering what would they do, think and feel, and in the end what they have they learned. Perhaps they will play around with several characters, seeing themselves in multiple ways. 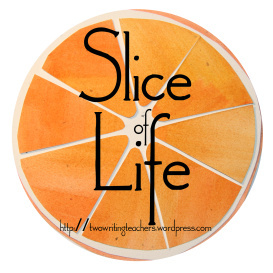 This week I have been sharing my read aloud world with the Slice of Life community. Every morning I’d read your comments, and be instantly supported and inspired for my next step. I have had the best coaches the world over (no hyperbole) right here. 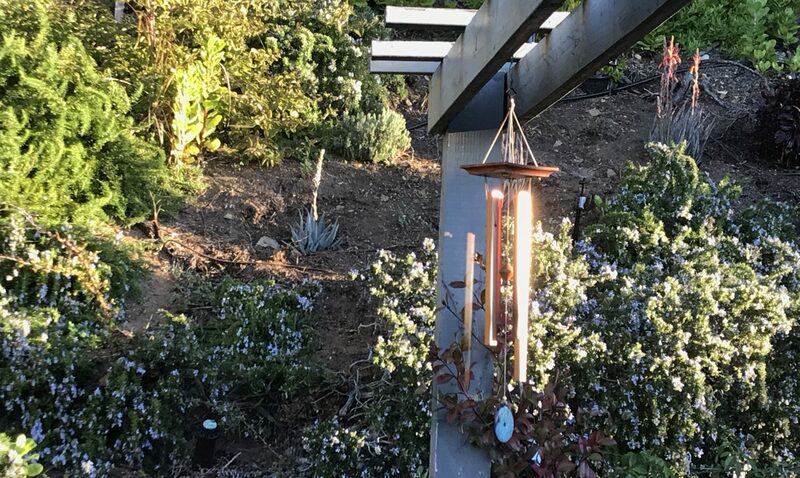 I appreciate the photos you’ve shared to give examples. I like the imperfection, too. Thank you for sharing these things today! I love the ideas you are using with your students. Thank you for sharing their responses!! I love to see the thoughtful and insightful reading work your students are doing! What a week of thinking and learning for your students! So carefully you have plotted these steps for this journey of the mind. It will be interesting to see if they apply it to their independent reading responses. Thanks for sharing your thinking and the students thoughts. 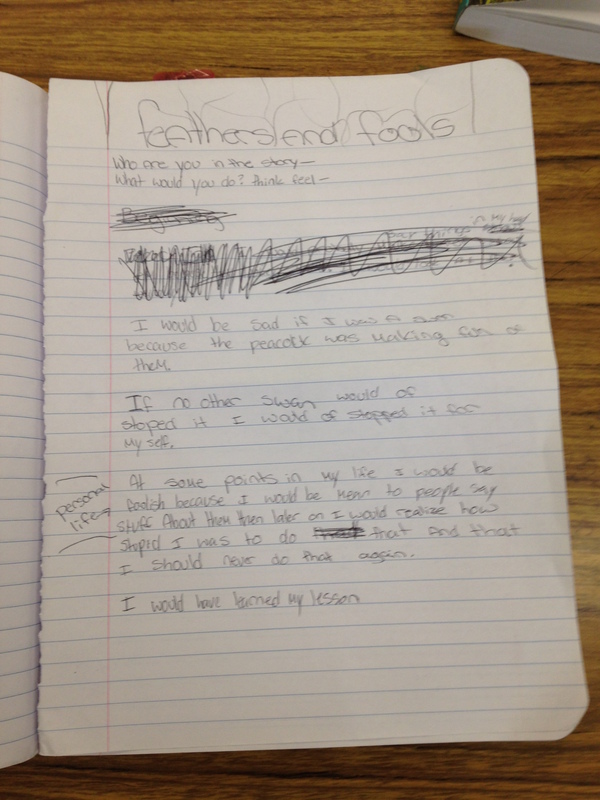 Love hearing the responses to Feathers and Fools, and will see how my students respond next week. I’ll re-visit Each Kindness, too, Julieanne. I wonder if that will be a good one for the older students, too? Maybe they do have some regret? Thanks for sharing all this. 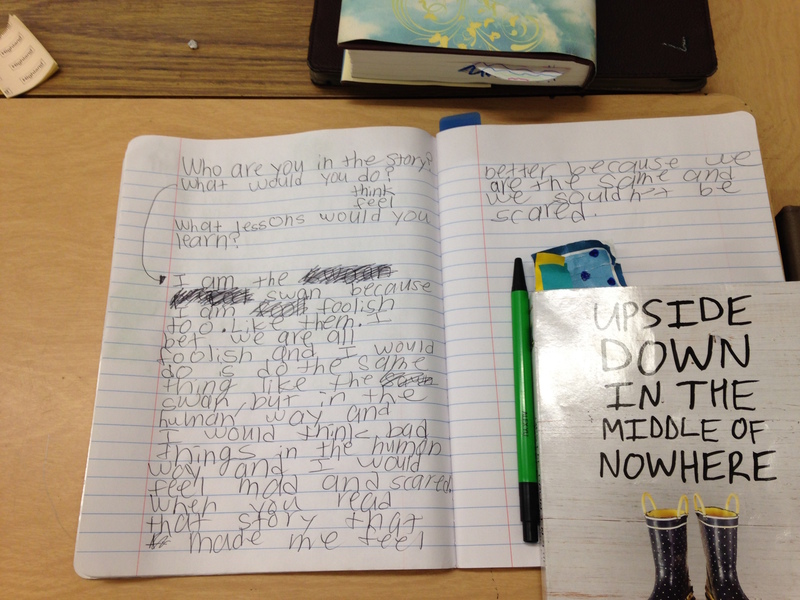 You’ve made me think in new ways for an approach to read aloud. I have not read Feathers and Fowls. I do love Each Kindness. I like to pair it with New Kid in Locamotiom. You and your students are such a source of inspiration. I am anxious to see how this has changed how they look at the characters in their independent reading. We are also reading Locomotion now. Thanks for mentioning this! You will love Feathers and Fools. Wow, Wow, Wow. This is what it’s all about. Read Aloud, Teaching, Learning. Your kids are connecting to the powerful words on the page. Thank you for sharing their responses. Beautiful. I love this cycle of read alouds, Julienanne – I see the way your choices layer themes and foster discussion. 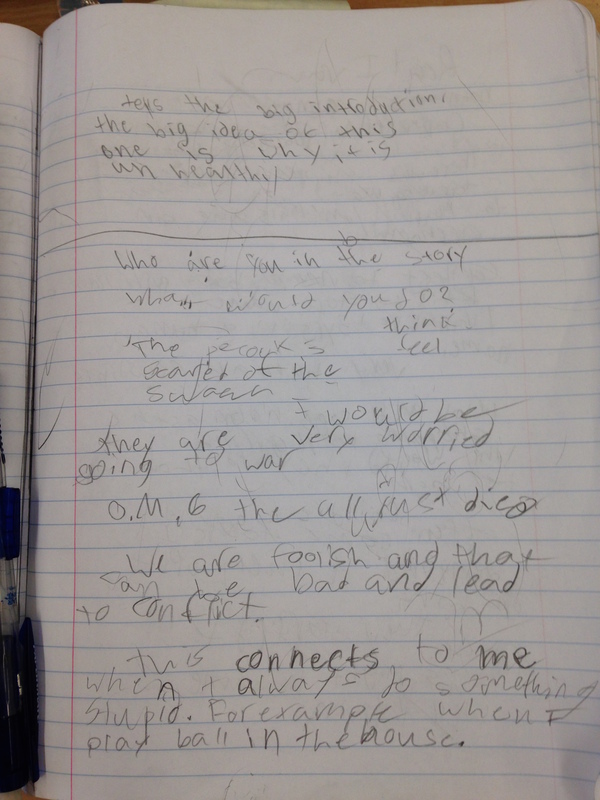 Loved the peeks into notebooks, too – aren’t kids amazing in the kinds of responses they are capable of? Honestly, Julieanne, it has been so fun to watch your classroom from far away this week. You did an amazing job at realizing something and doing something about it. I love the series of lessons you and (Terje) did. Wow. I have to get a copy of Feathers and Fools. This has been an incredible series of lessons, Julieanne! Thank you so much for sharing them with us.